Stubborn coughs, sore throat and congestion in the respiratory and bronchial tracts can be extremely painful and uncomfortable. 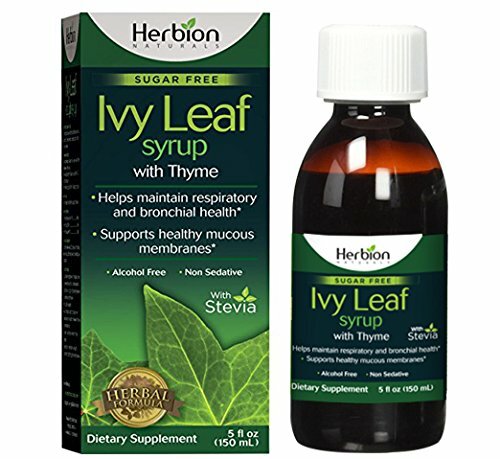 Herbion Naturals Ivy Leaf Syrup is a natural expectorant that helps our body’s natural tendency to combat nagging cough while maintaining healthy respiratory and bronchial functions. It contains plant extracts such as English Ivy, Thyme and Licorice that support mucous membranes, loosen phlegm, relieve cough, soothe irritated throat and relax the respiratory tracts. This balanced formula is rich in natural plant extracts. Ivy Leaf is the key ingredient in this syrup which is used to soothe respiratory tract congestion and inflammation. This syrup also has Thyme, that helps to relieve throat, cough and bronchitis. The Licorice in the formula is known to help ease respiratory congestions. This sugar-free supplement contains a natural sweetener known as Stevia which has low-calories. It is known to support the immune system with its antioxidant and antifungal properties.The supplement is gluten-free, alcohol-free, nut-free, non-sedative and is equally effective for adults and children. Herbion Naturals Ivy Leaf Syrup with its honey flavor, tastes great and naturally supports clear bronchial passages. Adults and adolescents: (older than 14 years of age): 2.5ml (1/2 teaspoon) three times a day. Children and adolescents: ( 5-14 years of age): 2.5ml (1/2 teaspoon) two times a day. Children (4 years of age): 2.5ml (1/2 teaspoon) once a day. Quality: Each product at Herbion is made using the highest quality of herb with the aim to provide natural products to its consumers. All products are prepared in an avant-garde pharmaceutical plant conforming to the latest International cGMP standards. Consult your physician before use if you are pregnant, lactating, have a medical condition or are taking any medication. These statements have not been evaluated by the Food and Drug Administration. This product is not intended to diagnose, treat, cure or prevent any disease. Keep out of reach of children. Store in a cool and dry place, below 77F. NATURAL HERBAL EXPECTORANT Ivy Leaf Syrup consists of natural plant-based ingredients including English Ivy, Thyme, and Licorice that help to relieve cough, soothe throat, loosen phlegm, promote healthy respiratory and bronchial functions. GOOD-TASTING IMMUNITY ENHANCER Ivy Leaf syrup is a tasty natural way to enhance immunity as it contains pure honey flavor, low-calorie sweetener Stevia, and medicinal herb extracts that have antioxidant properties, supporting the immune system. LONG-LASTING RELIEF It is a vegan supplement with enduring, cumulative effect. EFFECTIVE FOR ADULTS AND CHILDREN 4yo + Natural ingredients make it child-friendly throat syrup that is suitable for adults as well. FORMULATED WITH HIGH STANDARD TECHNIQUES Herbion Naturals products are carefully prepared in an ultramodern pharmaceutical facility conforming to the latest International cGMP standards. If you have any questions about this product by Herbion Naturals, contact us by completing and submitting the form below. If you are looking for a specif part number, please include it with your message.